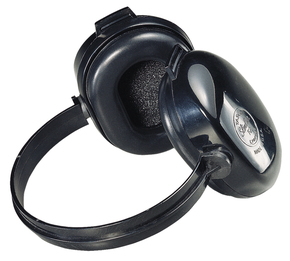 Tasco T-2 Slimline Low-Profile Neckband Model Ear Muffs may very well be the lowest profile ear muff ever created! These behind-the-head neckband style ear muffs are ideal for wear with hats of all kinds. The T-2 is incredibly light, weighing in at just 4.3 ounces. If an ultra light weight and a super low profile are the features you are looking for in a hearing protection ear muff, you simply won't find a better fit than the Tasco T-2.